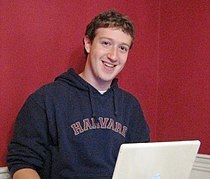 Zuckerberg was born on May 14, 1984, in White Plains, New York. 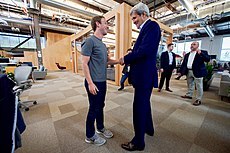 His parents are Karen (née Kempner), a psychiatrist, and Edward Zuckerberg, a dentist. He and his three sisters, Randi, Donna and Arielle, were brought up in Dobbs Ferry, New York, a small Westchester County village about 21 miles north of Midtown Manhattan. 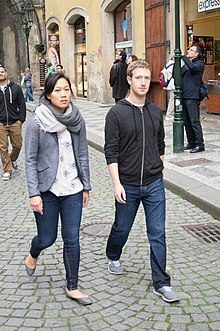 Zuckerberg was raised in a Reform Jewish household,[better source needed] with ancestors hailing from Germany, Austria and Poland. He had a Star Wars themed Bar Mitzvah when he turned 13 and once "questioned things" before deciding "religion is very important". Cambridge Analytica whistleblower Christopher Wylie criticized Zuckerberg over Facebook’s role in spreading religious intolerance in Sri Lanka. Moulavi Zahran Hashim, a radical Islamist imam believed to be the mastermind behind the 2019 Sri Lanka Easter bombings, preached on a pro-ISIL Facebook account, known as "Al-Ghuraba" media. ^ Shinal, John (August 1, 2017). 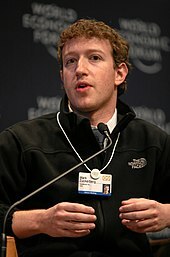 "Mark Zuckerberg is less than half the age of his super-wealthy peers". www.cnbc.com. Retrieved January 15, 2019. ^ Fell, Jason (May 14, 2014). "As Mark Zuckerberg Turns 30, His 10 Best Quotes as CEO". Entrepreneur. Irvine, California: Entrepreneur Media, Inc. Retrieved May 16, 2014. ^ "Facebook, Social Media Privacy, and the Use and Abuse of Data | United States Senate Committee on the Judiciary". www.judiciary.senate.gov. Retrieved April 10, 2018. 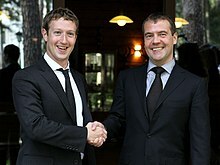 ^ "MArk Zuckerberg Facebook Post". Facebook. April 28, 2018. ^ Allsop, Jon (April 22, 2019). "After Sri Lanka bombings, a social media shutdown". Columbia Journalism Review. ^ "Sri Lanka bombings 'retaliation' for Christchurch mosque attacks, minister says". NZ Herald. April 23, 2019. ^ "Sri Lanka 'bombing mastermind' named as Moulvi Zahran Hashim". The Daily Telegraph. April 23, 2019.